The following examples demonstrates some of the features and capabilities available in the SansGUI Modeling and Simulation Environment. If you would like to have some hands-on experience with SansGUI, please go to the Download page to obtain an evaluation copy of the software. Cool -- Coffee Cup Cooling Effect: demonstrates a simplistic model of a cooling cup of coffee. Multiple cups of coffee are added to show the object-oriented nature of SansGUI. MatPlot -- Sine and Cosine Wave Generation and Plotting: demonstrates how to generate a sine and a cosine waves by simulator DLL routines and store the data points in a matrix. The matrix is looked up during a simulation run. The values in the two curves are added and then plotted. Feel -- Dynamic Model of Human Feelings: shows the feeling responses while a person is pushing a ball and then bumping into an obstacle. This example also demonstrates how to plot strip charts. IAC -- Interactive Activation and Competition: demonstrates inexact and associative information retrieval in a database using an artificial neural network. This example also shows how to take advantage of SansGUI's subassembly handling capability. New Solid -- Interactive 3D Graphics in SansGUI: explores the new interactive 3D graphics features in the upcoming SansGUI version 1.2 and demonstrates how SansGUI supports Silicon Graphics OpenGL programming directly in Microsoft Visual C++ and Compaq Visual Fortran. 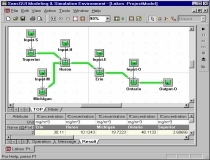 Mixer - Solving a System of Linear Equations: demonstrates how to programmatically prepare necessary matrices and tables for a chemical reactor/mixer network with various concentrations and flow rates in the components, a typical engineering problem that involve a system of linear equations. The equations are solved by using Naive Gauss Elimination or LU Decomposition algorithms, or calling the MATLAB engine from The Mathworks, Inc.
Calc - Visual Calculator for SansGUI: demonstrates how to program basic mathematical calculations in visual forms -- calculation flow diagrams. Using this utility, SansGUI users can draw mathematical equations with visual expressions, perform calculation, and plot data curves. Some application examples are shown. MIDIplay - MIDI Player for SansGUI: demonstrates how to implement an external process simulator to work in concert with an in-process simulator and chart data dynamically. 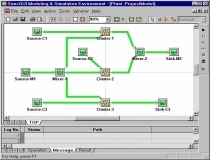 In this example, the external process simulator is a MIDI player that sends MIDI streams to the Windows multimedia facility for music playing while the in-process simulator fetches the MIDI event data and communicates with SansGUI for dynamic data display and charting. Unit - Unit Conversion for SansGUI: exploits the unit conversion facility and reference class features, such as Collection, Table, and Matrix, built into the SansGUI environment. Advanced features unique to this program are its extensibility, versatility, and programmability. Source code and example programs to populate tables and matrices are included.